7/11/00 - :)SMILIE SET DIGIMASK ON THEIR WAY @ POP2000! The latest Digimask application development is being demonstrated to an eager public at Pop2000 (17-19 November). The Popworld 'Snogging' application developed by :)Smilie is the World's first publicly available implementation of the Digimask technology and will enable young fans of all conquering Westlife and S Club 7 to 'virtually' snog their idols! Oo-er missus! As well as developing end-user applications, :)Smilie has been a key player in the realisation of the core technology and are very proud of the giant steps achieved in such short timescales. All the hard endeavours are beginning to spectacularly bear fruit. It is certainly an exciting time for all of us, watch this space! As ambitious technology firm Digimask prepares to go live in January, the firm has outlined its plans to bring its 3D modelling technology to the masses. To kick-start its mass-consumer campaign, Digimask has partnered with Popworld.com, the new online business by former Spice Girl's manager Simon Fuller. The online firm is hosting Pop 2000, which begins this weekend. Digimask is providing the event with Pop Snog, a custom designed version of its 3D head-modelling technology to enable young visitors to the show to virtually kiss their favourite Westlife or S Club 7 member, all of whom have had their heads translated into Digimask models. "This will be the first public appearance of the application," CEO Gary Bracey told MCV. 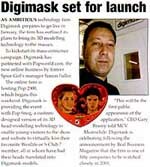 Meanwhile, Digimask is celebrating following the announcement by Real Business Magazine that the firm is one of fifty companies to be watched closely in 2001.